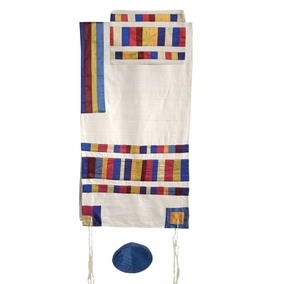 Silk Applique'd Tallit Set CAT# TRA - 1, 42" X 77"
Product Title: Silk Applique'd Tallit Set CAT# TRA - 1, 42" X 77"
Multicolor Raw Silk Applique'd Tallit Set CAT# TRA - 1. made from woven raw silk. The stripes, Atarah and corners are made of different applique'd raw silk. Size: 42" X 77" . 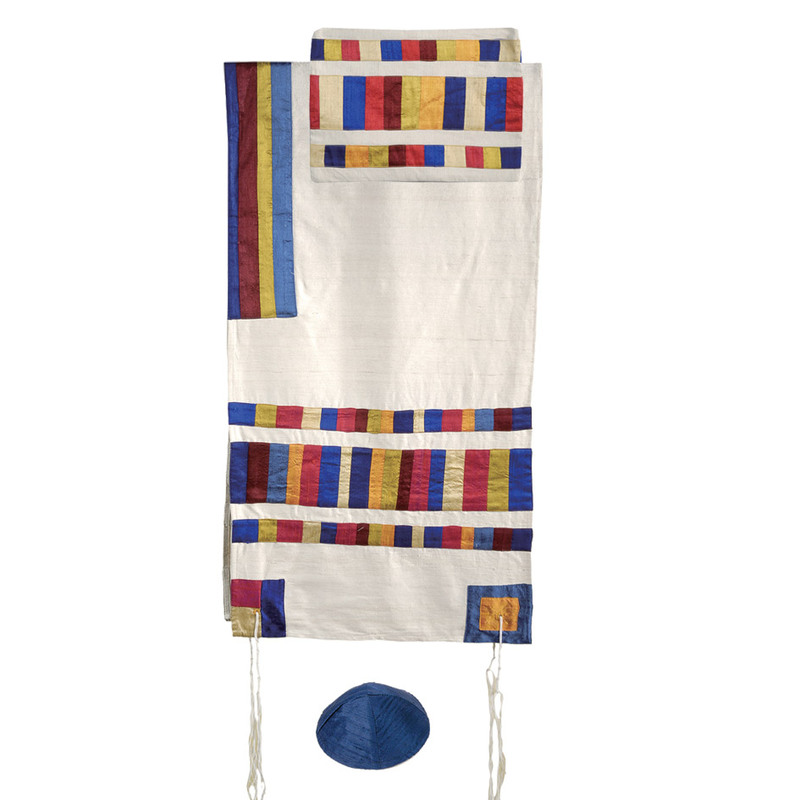 The taleth or talet (Sephardic Hebrew) tallit, also tallis (Ashkenazic Hebrew and Yiddish) is a Jewish prayer shawl worn while reciting morning prayers (Shacharit) as well as in the synagogue on Sabbath and holidays. The tallit has special twined and knotted fringes known as tzitzit attached to its four corners. It is sometimes referred to as arba kanfot (lit. "four corners") although the term is more common for a tallit katan, an undergarment with tzitzit. According to the biblical commandment, a blue thread known as tekhelet is supposed to be included in the tzitzit. Various methods of knotting the fringes have evolved.